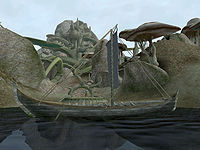 Alt Bosara is a small Telvanni town on the southern shore of Lake Boethiah. 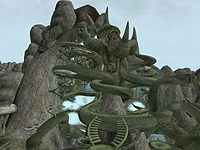 It is the southeasternmost Telvanni town of Map 2. A vast waterfall dominates the town, which is crowned by the Telvanni Tower Tel Vaerin, the tower of the Telvanni Councilor Master Vaerin. The tower itself is an expansive structure, with the central section encompassing four stories (each accessible only by levitation within). Two bedrooms and a small office branch off the third section and the mystically decorated chamber of Master Vaerin connects to the top floor of the tower. On the first floor, Dilavesa Indalen offers alchemical trading services, while the Mage Fedura Sendal watches over a shelf of trinkets on the second. In the west bedroom, Varasi Vaerin, the master's son, carries three different skill books, and in the office, the expensive potions, fine alchemical equipment and note with directions to all the Telvanni Councilors are notable treasures. 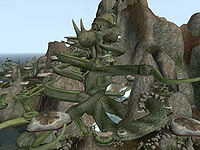 Guarded by the Spellsword Vinryon Sendal, the Master himself stands on a flowery pedestal and carries a Daedric staff. Sprinkled with a few housepods owned by commoners, the town offers a generous selection of services despite its humble size. On the left side of the waterfall Favana Selethi sells clothes, and above her Geroth Enlaris sells scrolls and offers enchanting services. On the right, the Weaponsmith Atherios Adirion can perform repairs and offers a selection of armaments. At the foot of the tower is a modest general store where Fevras Beran sells a wide variety of goods. Finally, on a separate hill to the north stands a cramped barracks where four guards stay the night crammed into the stuffy basement. Masalmalu Mendas at the River Strider port at the north end of town can take you to Tel Mothrivra and Llothanis (from there you can connect to Port Telvannis). Hlavora Gilnith also offers transportation services along the lake on her longboat. 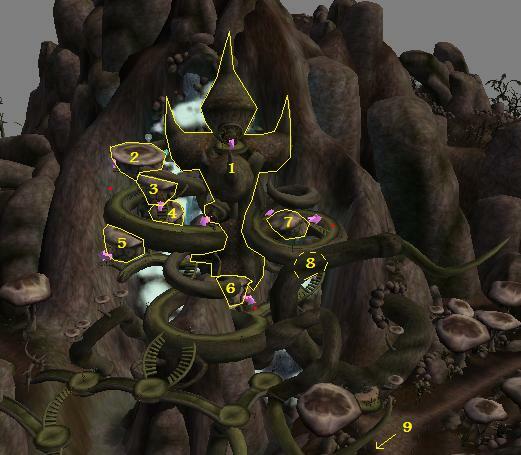 An early concept map indicates that Alt Bosara is supposed to be Greenheights from Arena. Verulas Pass — A tiny settlement that lies a short distance down the road south and west from Alt Bosara. Telvanni Waystation — A small stop booth just outside the limits of Alt Bosara, over the hills to the north. The proprietor is Medheleg. Jherun Egg Mine — An egg mine along the path to the west under the arches. There is a skeleton with Bonemold Armor as well as a sack of gold and potions. Theras Ancestral Tomb — An ancestral tomb farther down the same path. It has a significant number of altars with offerings and an Orcish War Axe in the sacrifice pit. Beranus Cavern — A medium-sized cave along the coast west of Alt Bosara. It makes a tunnel under the river to the other bank. Inside are many spores and mushrooms, and some ebony. However, much of this cave is underwater. You Can't Choose Your Family: Help someone with a brother bother. Telvanni Reports: Retrieve an overdue report.